One of my favourite quotes comes from a sign I saw hanging off a kitchen door when on holiday once, “Making meals and memories.” Ever since, this has been my mantra when I’ve been cooking for friends and family. With that in mind, if you take just one thing away from these tips, it’s that you’re not just making a meal for friends, but the dinner party is something to be remembered and memories should also be made. 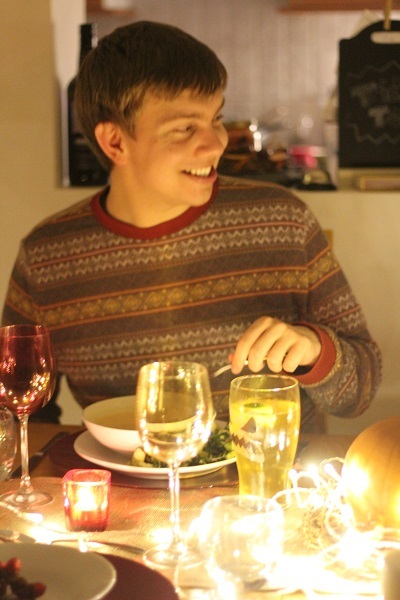 Without further a-do, here are my top tips for hosting a successful dinner party! When you are hosting a dinner party pick the guests you know the best. Chances are you will already know their likes and dislikes and they will be much more relaxed around your dinner table meaning you don’t have to worry so much. If you are inviting a mixed bunch, try to invite people with similar interests. If you have friends with very strong opinions try to avoid conflict and invite people who are likely to agree. One wildcard guest is probably enough! If you are sending out written invitations you could ask your guests to reply with any specific needs they might have. It’s also good to find out if you have any fussy eaters early on – I have a couple of vegetarian friends who don’t seem to eat any vegetables! By knowing who can eat what, you can plan your menu with confidence. Although you will want to impress your guests, now is not the time to experiment. The key to a successful menu is cooking dishes you know well and have cooked many times before. If there is a new dish you really want to try, make sure you have practices it a few times in the run up to your dinner party so there are no unwanted surprises on the night. Seasonal food is fresh and tasty so try to bring an element of the season into your food. It can also be a good talking point! One pot cooking is ideal for dinner parties. A large dish in the centre of the table acts as a focal pint and brings your guests together. It’s also nice as it give you the chance, as host, to serve your guests rather than simply bringing the food to them. Dishes that involve an element of “building” at the table are also fun. Your guests can then pick and chose what they want and no doubt the guests will get talking about who likes what. Once you’ve picked the main course, think strategy with the rest of your menu. If you main course is tricky and requires a lot of input, go for a simple starter. If it’s the main that is low maintenance, pick a complicated starter. It’s always best to have a pudding that can be made well in advance (perhaps even a day or two before), as by the time it comes to dessert you will either be too tired or too drunk to have to cook again! Having time to socialise is also key so try to build in time between courses where you can sit down with your guests, rather than be standing in the kitchen. 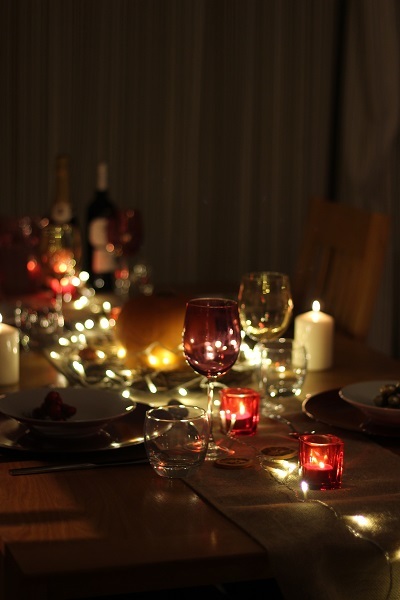 If possible, delegating part of the dinner is another clever way of minimising stress for you! Perhaps you have a friend who is known for his baking? Ask him to bring the pudding! Or maybe you have a wine buff in amongst your guests, give her your menu in advance and ask her to bring along some wines she thinks would work well. This not only compliments your guests and lets them feel like an essential part of the occasion but it gives you one less thing to think about! Once you’ve picked your menu, make sure you have enough ovenware, table ware, cutlery etc to cook and serve your menu. Knowing you have everything you need on the night will take away another element of worry. Often I get out all of the dishes and plates I want to serve up in and put a post-it note with the name of the dish on to each so that I don’t get confused! Failure to prepare is preparation to fail so they say. Do as much prep as you can ahead of time. There are plenty of dishes that taste best if prepared the day before and left overnight. Chopping, slicing and dicing can also all be done way before your guests arrive. This gives you more time to drink and socialise at the party. I hate the word “cheat” but you know what, sometimes cheating is OK! Don’t make the puff pastry yourself, buy shop bought! If bread really isn’t your forte, by a nice artisan load or two from the bakers. You don’t need the added stress and your guests will be grateful for the rest of the hard work you have put into the evening. Once you’ve got your menu planned and you know when your guests are arriving, you can start planning timings. These should be a lose guide (as not everything will go to plan) but should give you key pointers about how long different elements take to cook. E.g. put the bread in to warm, 5 minutes before the end of the starter cooking. Put these somewhere in your kitchen so you can refer back to them as you cook, perhaps on a pin board or attached to a cupboard door. 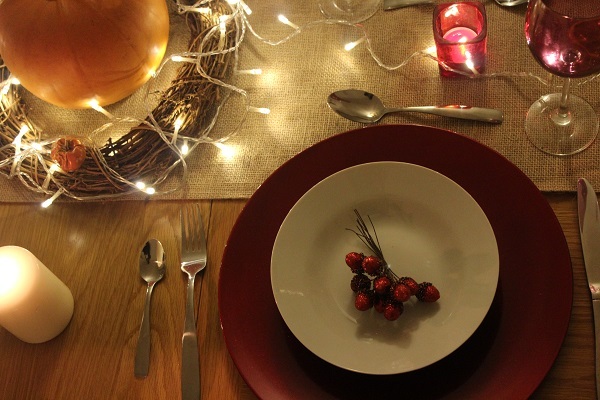 Dressing your table the night before is a great way of saving time. Pick a decorative table runner or table cloth, use complimenting place mats and napkins before adding cutlery, plates glassware and any place cards or centrepieces. Centrepieces should be kept low so that it’s easy to see the other guests across the table! The dinner party playlist has articles and list posts dedicated to it all over the internet but I’m going to buck the trend and say “don’t worry about it!” As long as you aren’t playing anything offensive, the music will just be playing along in the background and won’t be noticed by most. Turn it on and let it play. Job done! 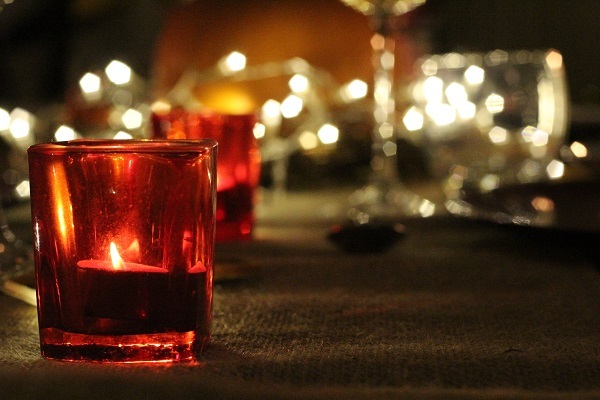 For a really intimate vibe, set the tone with mood lighting. Dimmed lights can be achieved by a dimmer switch (no dur!) 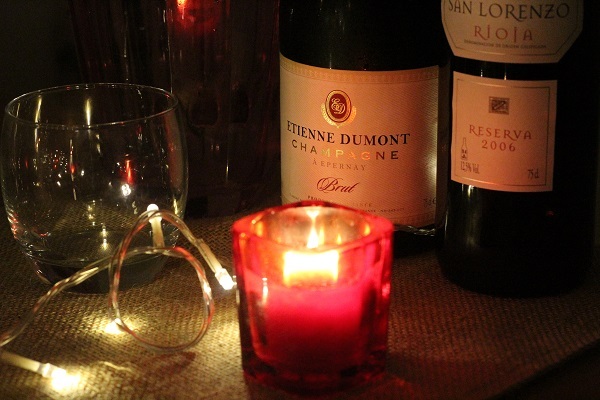 or by using votive candles, table lamps or even fairy lights! Get creative! Just make sure the lighting is warm rather than neon or fluorescent. Canapés are nice, but a signature cocktail when your guests arrive is even better! 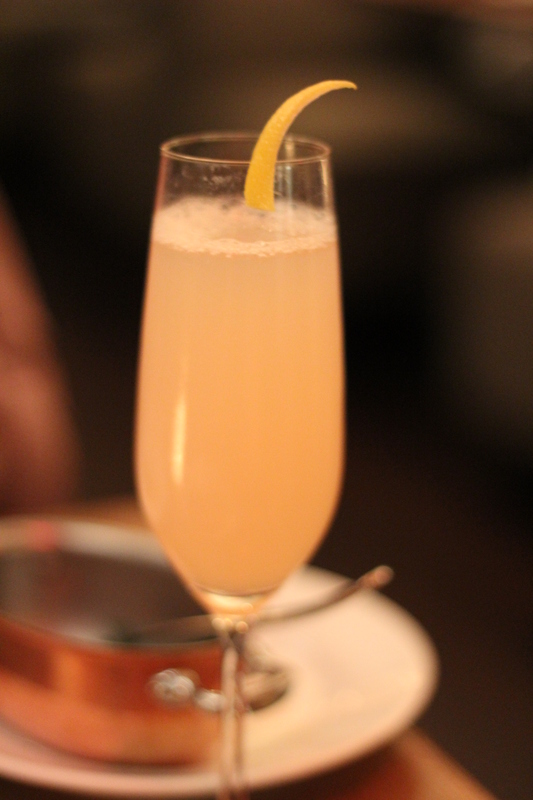 Perhaps you have a favourite drink you want to share with your friends? Or maybe you’re feeling inventive! A cocktail on arrival is a great way to get people in the party mood and create some chit-chat. You might be scared of your friends ruining their appetite, but having a few small bowls of snack around your home will mean that any hungry guests can have a nibble without disturbing you in the kitchen. Dinner may not be on time but if there are snacks already out no one will realise you’re running a little off schedule! The most important thing is that throughout the whole party you feel comfortable and that you are having a good time. There is no point throwing a dinner party if you are going to be uptight! Don’t bother trying to cook in high heels, padding about barefoot gives a much more chilled out and relaxed vibe and will instantly put your guests at ease. By all means dress up, but make sure you’re going to be able to cook in the kitchen without setting sequins on fire! Most mistakes won’t come tot he attention of your guests. When they do, laugh about it! Your guests really won’t mind (after all its a free dinner!) and there’s no point getting yourself upset – you’re making happy memories remember! One of my best bits of advice is to clean as you go. You never know when that extra spoon might come in handy and I promise you, you won’t want to be doing any washing up at the end of the night! If the first lot of washing up is done it also means your kitchen won’t feel quite as chaotic when you move on to the next course. 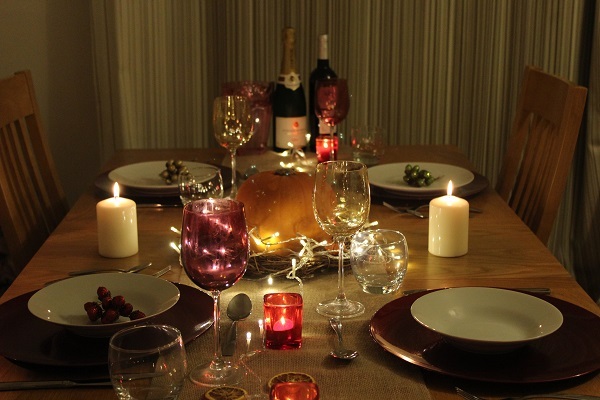 Last but not least, on the night make sure you spend plenty of time with your guests. Hopefully you’ll have picked a menu that allows you to prep before they get there, and whack it in the oven once they are, meaning that you have as much time as possible to have a good old chat! After all your not just making a meal, you’re making memories! I’d love to hear your tips in the comments below! My number one tip to all my friends is No matter how behind you are running I always make sure the table is set. That way people will think you are in the kitchen because that’s what the meal requires and not that you are running late. Have to confess I’m never prepared enough to do it the night before though!